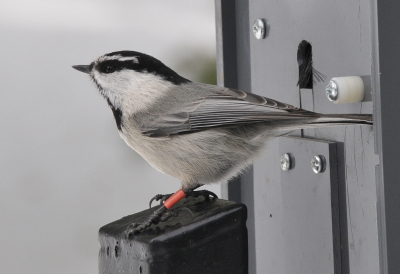 We use RFID-equipped feeders to test spatial learning in chickadees. Spatial arrays consist of 8 RFID feeders and each feeder has an antenna connected to an RFID board inside the feeder that controls a door. When a bird lands on the antenna, the board reads and records the PIT-tag ID with time and day. If the ID is programmed into the board, it will open the door allowing the bird to take a seed. If the ID is 'incorrect', it will be recorded, but the door will not open. So each bird has to learn the location of a feeder that provides a reward (different feeders provide rewards for different birds so social learning is discouraged). As birds learn these locations they stop visiting non-rewarding feeders and only come to the rewarding feeders. By showing that the number of 'non-rewarding' feeders prior to visiting the rewarding feeder is getting smaller with every trial, we show learning.